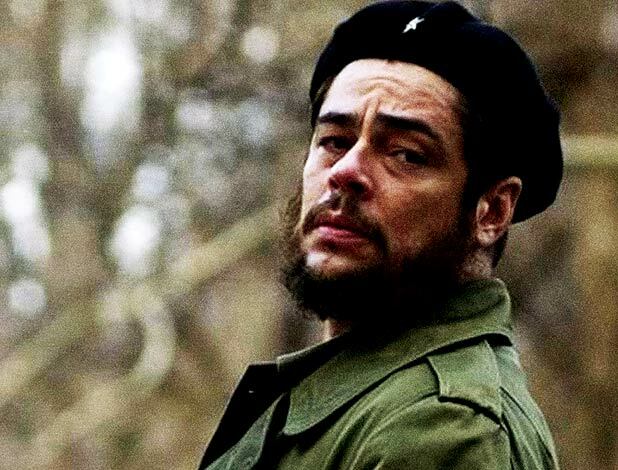 Che Guevara’s final fatal campaign in Bolivia gets bold and bleak treatment in the second part of Steven Soderbergh’s extraordinary bio-historical epic about the ultimate revolutionary. It’s 1967 and Guevara (Benecio Del Toro) enters Bolivia disguised as a Uruguayan businessman. Before long he has made contact with the native Bolivian communists at their training base camp in the remote Ñancahuazú region. His plan to force another people’s revolution using a small guerrilla army soon falls apart in the face of US military intervention, divided support from the local communist party and faulty equipment. Eschewing the giddy jigsaw puzzle structure and collectivist optimism of the first film (with its delightfully sly nods to Robert Aldrich and Sam Peckinpah) for something more forensic and fatalistic, Soderbergh (as both director and cinematographer) drains away the warm colour palette of the first film and shots on super 16 with no dollies or cranes (just handheld and tripod shots). Che: Part Two is a rigorous day-to-day account of a guerilla campaign. Taking his lead from Gillo Pontecorvo’s The Battle of Algiers, Roberto Rossellini’s The Rise of Louis XIV and Robert Bresson’s A Man Escaped, Soderbergh creates a portrait of a man that is at once objective and invested with ideological perspective. With these two films (which are best seen together) Soderbergh has created a remarkable cinematic diptych that is at once mesmerising and immersive. It’s actually a trance from which you emerge saddened, hopeful and with a hunger to learn more about the hirsute Argentine Marxist revolutionary who tried to change the world, for the collective good.